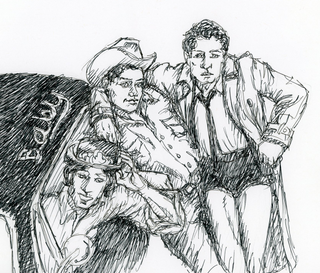 Way back in the summer of '13 I posted a little thing about Knight Rider and The Dukes of Hazzard and when Cat VonAwesome had the brilliant idea of Supernatural's Winchester Bros. playing the roles of Bo and Luke Duke, Serenada, in complete Serenada fashion, ran with the concept and produced this wonderful drawing with Cas as Daisy, complete with the ultra-tight short shorts. To me this embodies everything I loved about her and I am going to miss her greatly. If you have anything you want to add please do so. I just wanted to share this because it always makes me smile.